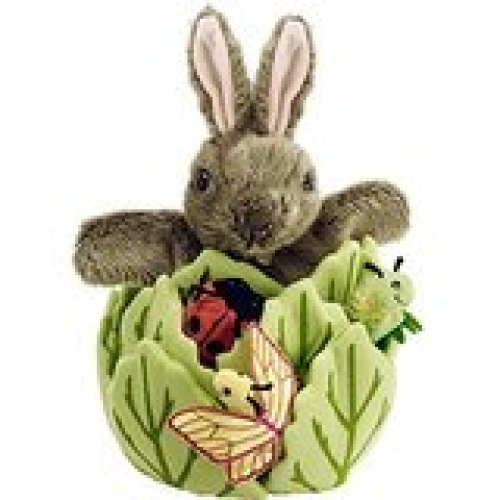 The Puppet Company - Hide Away Puppets - Rabbit in A Lettuce with 3 Mini Beasts Hand Puppet The Rabbit lives inside the lettuce which gives you access to make him/her hide and appear out of his home to great effect. The 3 mini beasts included are Butterfly, Ladybird and Caterpillar. There are 10 leaves of the lettuce that have Velcro to hold it in place but can be folded back to reveal a Mini Beast finger puppet friend. Suitable for children aged 12 months and over. Dimensions: Height: 33 cm.